With this Operation Desert Storm First Air Attacks DVD, you're on board the awesome aircraft carrier USS John F. Kennedy during the 'Live Action' First Strikes of the Gulf War! Go where only few have gone before and see F-18s, F-14s, A7 Corsair IIs (since retired), CODs, Harrier Jump Jets, Helicopters, S3 Vikings, E-2Cs. Takeoff and return from their dangerous missions. Catch night takeoffs and see the stunning afterburners. The action is breathtaking as very few have seen the raw action on a carrier at war! Watch the U.S. Navy at its finest hour and In Action! NOTE: This film contains 'Raw Action' that contains shaking as it was taken in extreme wartime conditions. Many scenes are shot unedited to give the best feeling on board the aircraft carrier AT WAR! F-18 film footage is from present day training exercises! The aircraft carrier USS John F. Kennedy was commissioned in 1968 and is named after the 35th President of the United States. It carries 69 aircraft and over 5,000 personnel. In the late 1980s, USS JFK carrier planes shot down two Libyan Mig-23s in the Gulf of Sidra incident. 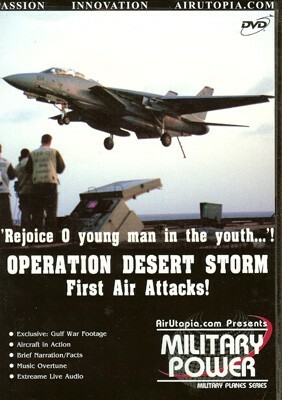 The run time for Operation Desert Storm First Air Attacks DVD is about 75 minutes. Format is NTSC DVD and region-free.